is a large and diffuse reflection nebula illuminated by the bright light of Rigel, the foot-star of Orion the Hunter. 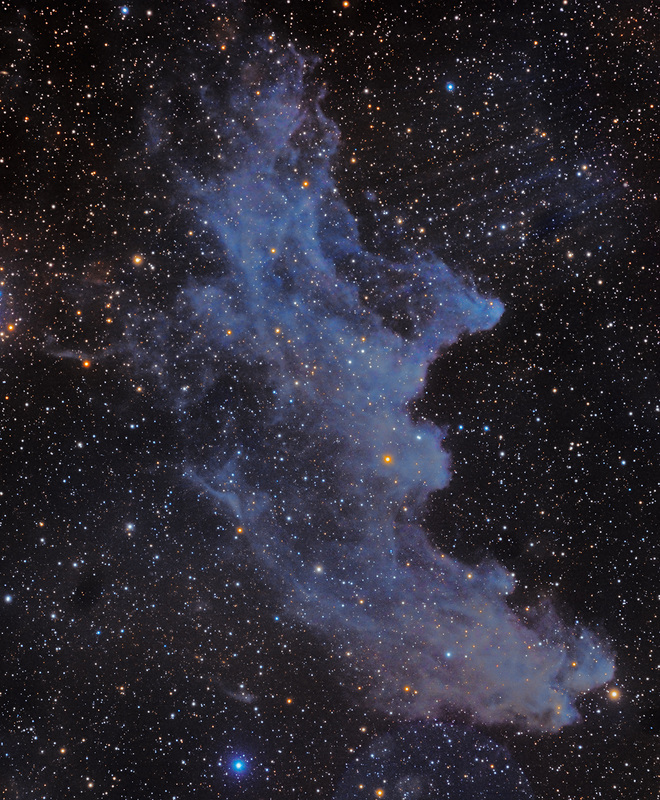 The Witch Head lies just over the border in the constellation Eridanus the River at approximately 1,000 light years from Earth. Notice the redder nebulosity surrounding her eye, an indication that star birth is occurring within the nebula. For too long, her enormous structure eluded me. Thanks to the larger field of view of observing partner Mike Miller's refractor, she was acquired in a two-panel mosaic, my first accomplished with PixInsight. Looking at the old crone's profile, can you hear the evil cackle of this witchy woman?